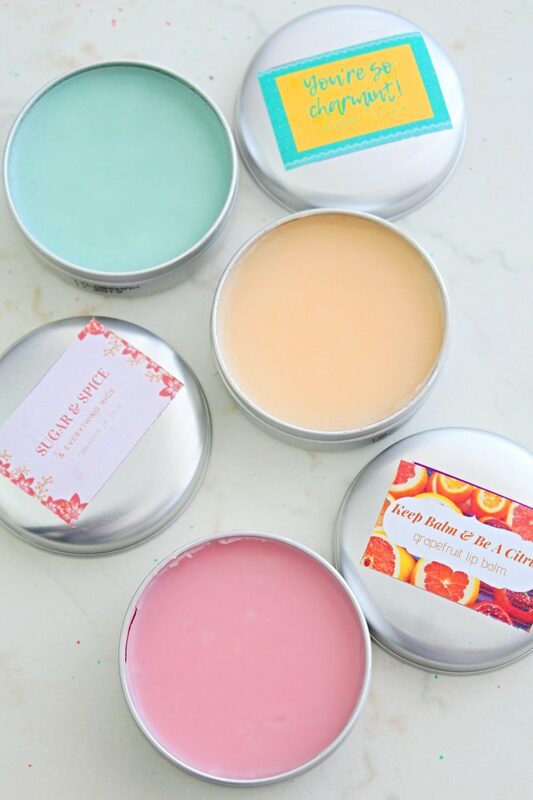 Have you been looking for a quality, all natural lip balm? Then why not make your own natural lip balm recipe? This DIY tinted lip balm uses only natural ingredients so it’s safe for you and the environment and is super effective for your chapped lips! I struggle so much with chapped lips, no matter the season! It aggravates in summer but windy weather is a real killer! So I’ve decided to get ready for the cold season with a DIY tinted lip balm! In fact, I got really excited and made three. Plus I couldn’t make up my mind on the color and flavor of my all natural lip balm (yup! these beauties are not only functional and effective but are so yum and flavorful too!). So I thought I should give myself a few options. 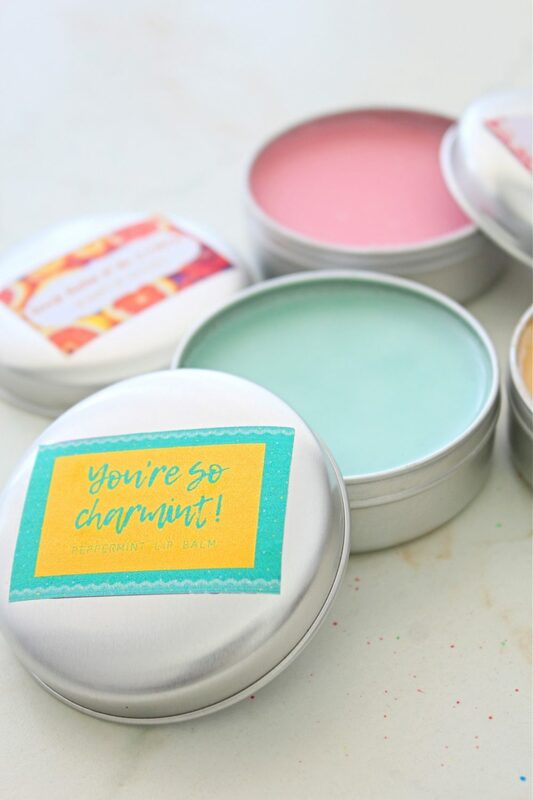 I opted for pink, orange and mint color and I chose cinnamon, grapefruit and peppermint essential oil to flavor and scent my homemade lip balm recipe. 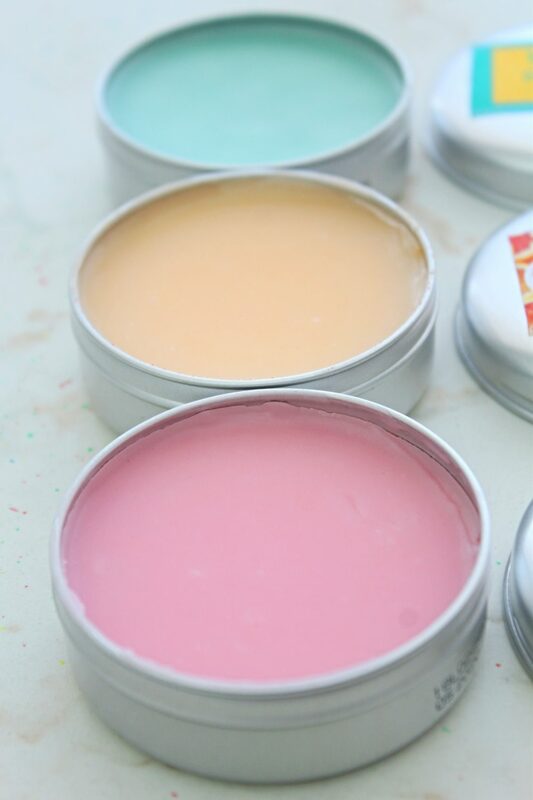 This DIY tinted lip balm looks cute with all those sweet colors but that’s not all! My DIY lip balm recipe is so powerful and lasts for hours (literally! ), I don’t think I’m ever gonna go back to the store bought version. I tend to lick my lips a lot (mainly to moisturize them which instead turns them dry) and I normally need to apply lip balm or gloss a few good times a day. Not with this DIY tinted lip balm! As I write this post it’s been about 5 hours since I applied it and this DIY beeswax lip balm is still sticking to my lips although I had food and water a couple of times since applying it. 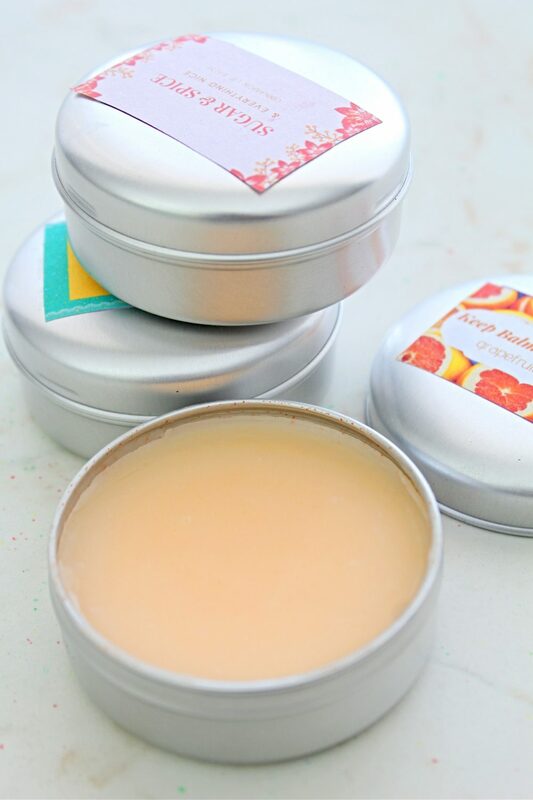 The reason I think this amazing DIY lip balm with coconut oil is so super lasting it’s the all natural ingredients. I used coconut oil, almond oil, beeswax essential oils and gel food coloring. The final result seems and feels a bit too solid but once rubbed with the finger, my DIY tinted lip balm transfers really well to the finger and then to the lips where it sticks like glue. I am super impressed I tell you! I never expected this result! You can always leave your natural lip balm un-tinted but I think it looks so adorable with a bit of a color so I chose something safe like food coloring. There’s a little trick involved when using food coloring though which I highlighted below, in the instructions. Here’s how to make your own DIY tinted lip balm. The ingredients below are for one medium container of lip balm. 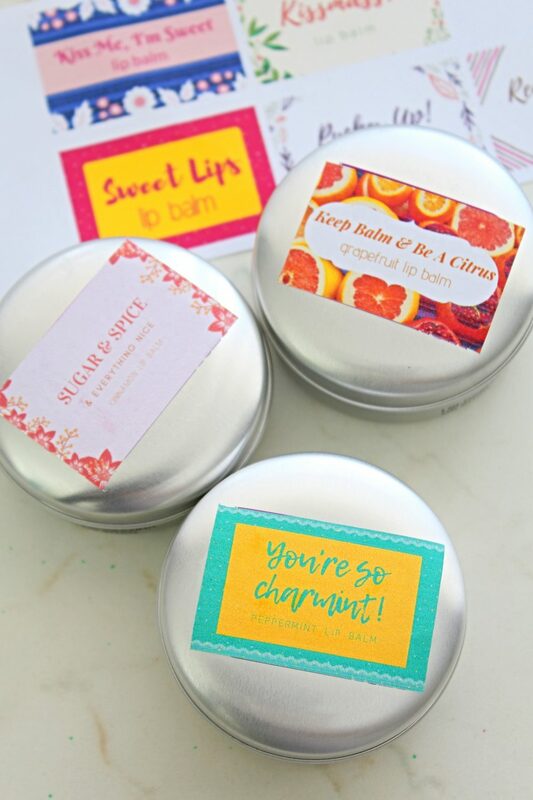 P.S These lovely lip balms would make such a nice gift idea for holidays. 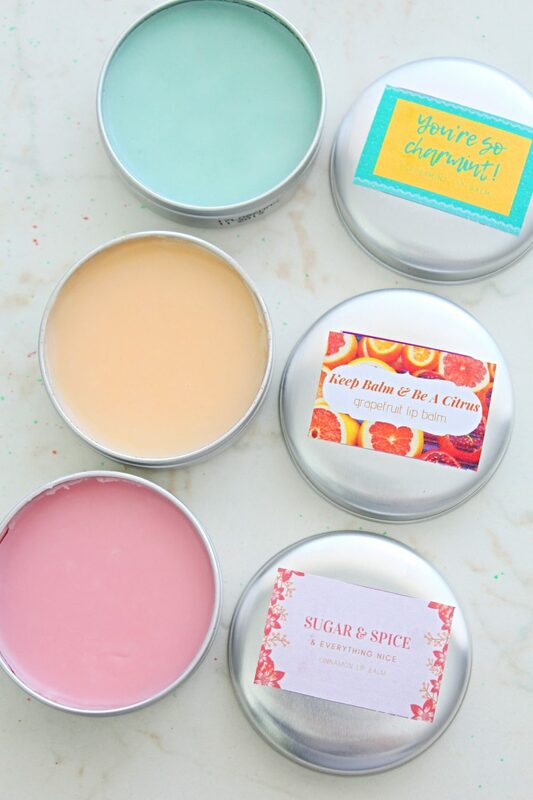 So I made a few cute labels for you to use on your homemade lip balm. They’re free for my email subscribers but if you don’t want to subscribe, these are available to purchase here. You need to melt the ingredients on a bain marie or through a bain marie method as I did. Fill the saucepan with some water and place the bowl on top. The top of the bowl should be larger than the saucepan so it sits on the saucepan half way trough and should not touch the water. Bring the water to a boil and urn the heat on low. 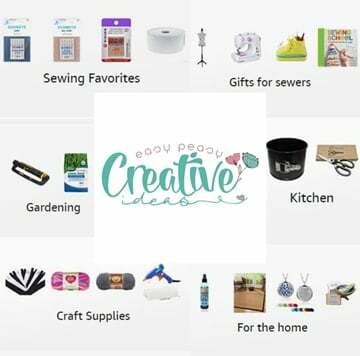 Add essential oils of choice. For the pink balm I used cinnamon, for the orange I used grapefruit and for the mint one I used peppermint. Mix well then remove the bowl from heat. 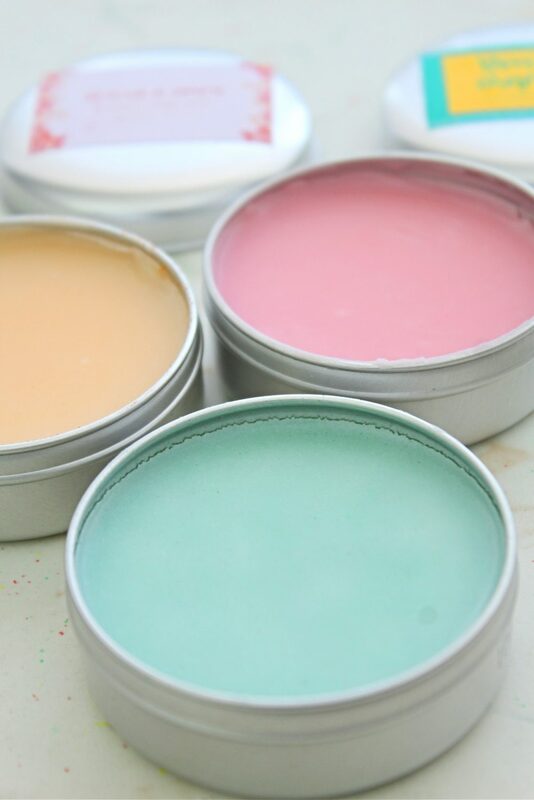 If you don’t want a tinted balm, pour the content into a medium container or a couple of small container and leave overnight before using. If you want a tinted lip balm, leave the bowl on a side until the liquid solidify just a little then add food coloring. For the pink one I added 3 drops red food coloring, for the orange I used 4 drops yellow food coloring and for the mint I used 10 drops green food coloring. The food coloring I used is gel not liquid. Mix well until the food coloring is completely incorporated into the balm then return to saucepan and melt the balm again. When completely melted, pour the liquid into containers and leave overnight to solidify. 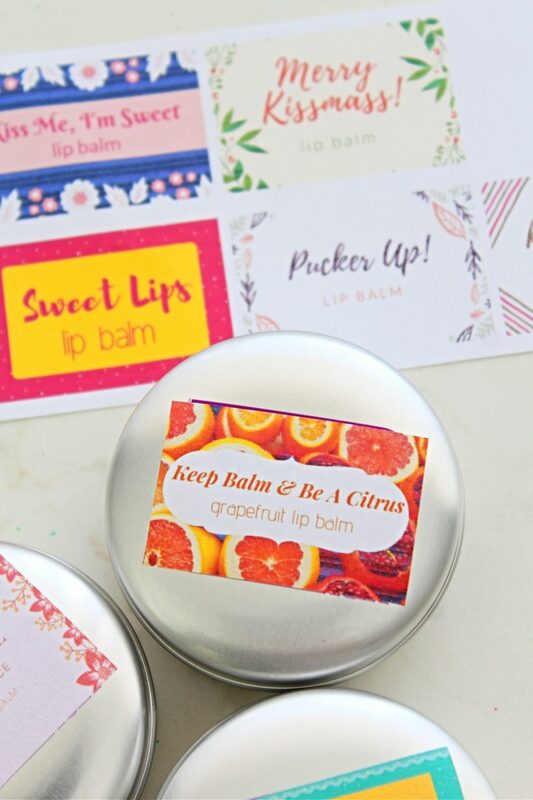 Add a cute label to your container and you’re ready to use your natural lip balm! If you liked this tutorial please let me know in the comments below and don’t forget to rate it! Referring to beeswax is it white or yellow beeswax you use and is the coconut oil fractionated organic. Hi Katie. Beeswax is white and coconut oil is extra virgin, both seen in the video. What is the shelf life of these lip balms? 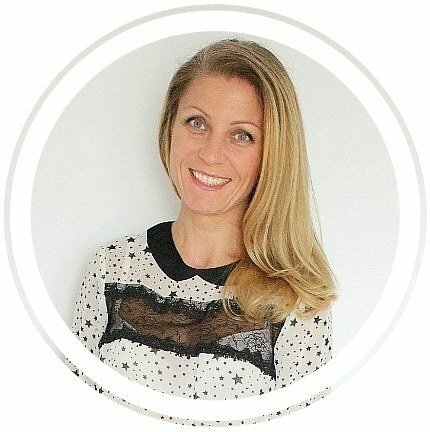 Laura, I wouldn’t use any beauty product, natural lip balm included, for more than 6 months. Just have one question do you have to use glass or can you use metal? I’m not sure what the question is, Kasey. If you’re referring to the glass bowl used for melting the ingredients, metal would do too if it’s meant to stand use in high temperatures such as the oven’s. I used a glass bowl because it was fitting perfectly on top of my saucepan. If you’re referring to the containers to store the balm, mine are metal so both would do just fine. They look lovely I can’t wait to try them! Thanks, Lorrie! I’m very glad you like these! Enjoy!